The CBO released a revised US national debt forecast last month, which I wrote about here. Basically, a combination of the sequester, fiscal cliff, improving economy, etc. mean that the deficit as a percent of GDP will shrink over the next 2 years and then begin to slowly rise, all at a manageable rate. In other words, we’ve accomplished Republicans’ #1 economic priority – deficit reduction. This of course assumes that intermediate events don’t change that forecast, either for better or for worse. It’s worth exploring what caused that deficit in the first place. Ezra Klein wrote a great piece last week on Republicans’ odd willingness to trust 30-year CBO projections. He used the chart below from a Pew Foundation report to show how wildly off the CBO can be in terms of even 10-year projections. Note that the chart isn’t entirely up-to-date, but I think the broad conclusions are the same. I want to talk about a point different from the one Klein made, namely that much of the rise in debt is self-inflicted. It’s us scoring on our own goal through legislative choices like unnecessary tax cuts that disproportionately benefit the wealthy and a wholly unnecessary war in Iraq. And, as must be pointed out, the most egregious examples started under the last administration. 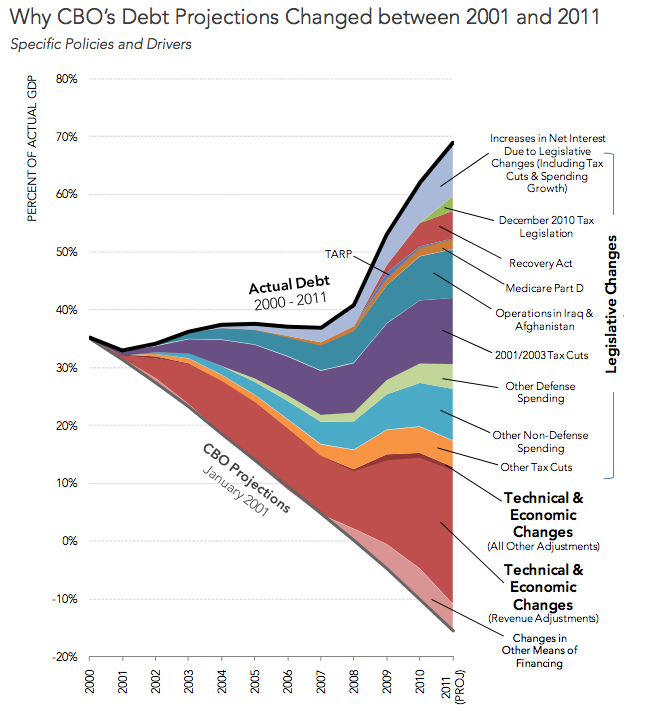 The biggest single driver of debt growth has been the reduction in revenue caused by cyclical downturns in the economy, especially the recession that started in 2007-08. 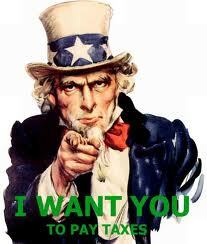 As we are starting to see, the number one thing the US can do to stabilize deficit spending is to grow the economy. We can’t cut our way to no debt. This seems like a basic fact to me, but it’s not necessarily accepted wisdom in Washington, especially among Republicans. It’s hard to overstate how damaging the 2001/2003 tax cuts under GW Bush have been to debt levels. After the economic downturn, these tax cuts were the single greatest contributor to rising debt. If this doesn’t serve to dispel the fanciful notion that on their own tax cuts always raise revenue, I don’t know what will. The tax cuts and war in Iraq were entirely unnecessary. They were very poor choices and, in the case of the Iraq War, it’s consequences reached far beyond helping to explode the debt. These are examples of us self-inflicting pain. I’d add the 2009 decision to continue and to escalate the war in Afghanistan – a decision made by Obama – to this list as well. TARP and the 2009 stimulus barely register as major contributors to the debt. Combined, they account for <7% of the rise in the debt after 2001. The two wars and the 2001/2003 tax cuts account for 4x the rise in debt. If Republicans really want to address the debt issue and win back public support at the national level, they need to honestly reckon with this fact. They haven’t so far and will continue to lose national elections until they do. As best as we can predict the next 10 years, our near term fiscal house is in order. The US economy continues to recover, albeit slowly and weakly. The focus should be on stimulating demand to accelerate this progress. Much of the fiscal and political problems we’ve had over the last decade are entirely self-created. Compared with the much of the globe, the US has an excellent opportunity to lead the world out of recession and to have a more productive decade than the last. That will not happen, though, if we enact dumb legislation and fail to pass sensible laws (think Immigration). We need to stop scoring on our own goal. The corporate tax code (and personal as well) is insanely complex. This complexity creates an untold number of deductions, exemptions, etc. for companies to utilize to lower their tax rate. Complexity in rules creates opportunities for avoidance. The code should be simplified. It would make it easier for the government to enforce, easier for companies to structure their tax policies, and would offer a win-win for companies (reduced compliance costs, better transparency, etc.) and the government (more revenue, easier enforcement). It’s not the job of Apple or any other business to decide the right level of taxation, set optimal social policy, etc. The system is set up in such a way that it asks companies to maximize revenue and profit to the extent that they aren’t doing anything illegal. If we want to change the system, fine. But Apple is only playing its role (maximize profit to the extent legal) within the framework that we/Congress have created. Similarly, if we want Apple or American businesses to pay more in taxes, we should change the tax code. Nobody is accusing Apple of doing anything illegal. They’re simply following the law, which happens to be extremely complex and allow for the type of tax structuring that Apple has followed. If Congress is unhappy with Apple, then change the rules. Finally, this whole episode is bringing up the issue of what we should do about overseas cash that companies have sitting in offshore accounts. In a nutshell, multinational US companies earn money overseas. If they repatriate that money back to the US, they have to pay US corporate taxes on the overseas earnings, whereas many other countries don’t tax earnings outside their borders. So cash sits overseas. US companies have over $800b of cash sitting abroad. Apple has about $100b of it’s $145b total abroad. We need a way for US companies to bring some of this overseas cash into the US. There’s no sign that under the current regulations any US company plans to repatriate cash. This is bad for the companies and it’s bad for the government since we’re earning no tax revenue on these earnings. I don’t know what the right rate is for these overseas earnings, but it should be something that’s broadly acceptable to most companies as well as the government. Having said that, I don’t buy the argument that simply letting companies repatriate their cash with a lower tax burden is going to somehow spur new investment. US companies, including Apple, are already sitting on record levels of cash here in the US. If they want to invest in the US, they already have plenty of cash to do so. The reason they aren’t investing isn’t a lack of cash, it’s a lack of aggregate demand from consumers and other businesses for the goods/services that businesses are selling. Changing tax rates won’t solve this. We could lower Apple’s tax rate to 0% tomorrow and that won’t change the investment decisions they make. Businesses are rational. If Apple saw growth opportunities they could capture by investing in the US, they would do it irregardless of tax rates. They have plenty of cash to do so. This also gets to some of the arguments around businesses and employment. Many people argue that if we lower the corporate tax burden, this will kickstart hiring by companies. The same argument applies. The reason companies aren’t hiring more aggressively isn’t a lack of cash/margin to do so, it’s principally a lack of demand and other factors like increasing productivity from existing workers. If order books, foot traffic, etc. were growing at a brisk pace, companies would hire to meet the demand. Absent that, why would they hire additional workers? Some of this logic might not apply to small and medium size businesses. For business with less scale, lowering their tax burden might provide those businesses with the additional capital they need to make investments. Would love to hear a strong argument why this is also the case with large businesses. …estimating that the deficit for this fiscal year, which ends on Sept. 30, will fall to about $642 billion, or 4 percent of the nation’s annual economic output, about $200 billion lower than the agency estimated just three months ago. The agency forecast that the deficit, which topped 10 percent of gross domestic product in 2009, could shrink to as little as 2.1 percent of gross domestic product by 2015 — a level that most analysts say would be easily sustainable over the long run — before beginning to climb gradually through the rest of the decade. “Revenues have been strong as the economy has outperformed a bit,” said Joel Prakken, a founder of Macroeconomic Advisers, a forecasting firm based in St. Louis. Over all, the figures demonstrate how the economic recovery has begun to refill the government’s coffers. At the same time, Washington, despite its political paralysis, has proved remarkably successful at slashing the deficit through a variety of tax increases and cuts in domestic and military programs. This should lay to rest the constant clamoring from some that we are somehow facing an imminent debt crisis that requires debt spending cuts. The biggest problem facing the US right now is high unemployment and a general lack of economic demand, not unsustainable levels of deficit spending and debt. Bottom line: in the medium term, we’ve basically addressed the deficit. One of the biggest threats to the economy right now, though, would be continued, premature cuts in government spending that further exacerbate the unemployment problem. It’s somewhat ironic, but one of the biggest threats to growing the national debt would also be premature cuts in government spending. 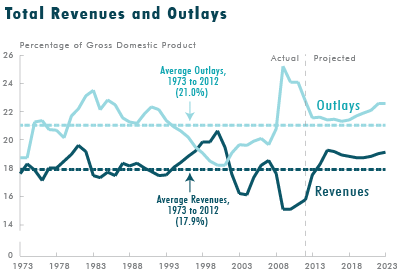 If growth and consumption are hurt by government spending cuts, this will depress revenue and grow the deficit. This shouldn’t be controversial. Look at the UK and Europe to see what happens when you make deep cuts in government spending in the middle of a fragile economy. Unemployment, no growth, rising deficits. It isn’t pretty.